This book is available as a print book, ebook and audiobook. The ebook edition is included with the print book. If you want all three versions, add both the print book and audiobook to your shopping cart. You'll receive the ebook for free, and the audiobook will be discounted at checkout. In Intervention, Dan described how he evaluates adults and suggests course corrections to improve the basics. He followed that with Can You Go?, where he addressed assessments trainers and coaches might use with their clients and athletes. Now, in Now What? Dan loops back around to tell us what to do next. You’ve brought your clients up to the minimum standards. You’ve done your assessments. That’s the question Dan answers in the third installment of this series. Dan John’s Now What? 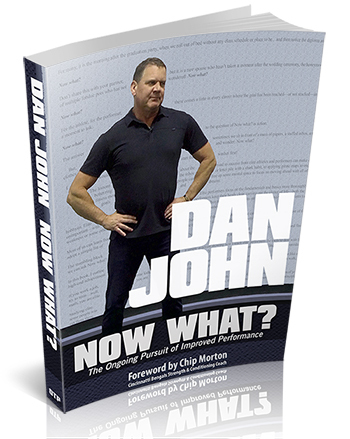 will help you determine the next steps in moving toward the goals of your clients and athletes. The lessons learned about the road to success from elite athletes and performers can make everyone’s life better. From de-cluttering the inbox or letter pile with a shark habit, to applying pirate maps to ongoing health and fitness, most people can free up some mental space to focus on moving ahead with all of life’s goals and dreams. Elite performers focus on the fundamentals and basics more thoroughly than the hobbyist. Elite performers keep their heads clear, carving out the clutter of life—both the important and the unimportant—with a scalpel. When needed, the elite focus on two- to twelve-week programs to shore up a weakness or some other issue. Elite performance is principle based. Most of us can learn from this “carving of the clutter.” At times, we can follow a program, but most of the time, we can adopt a simple list of pirate maps for our fitness, health and longevity needs and goals. The stumbling block of Now what? soon takes on a new meaning. After emptying the inbox and finishing the laundry, we can ask Now what? as the start of a new adventure, a new challenge. 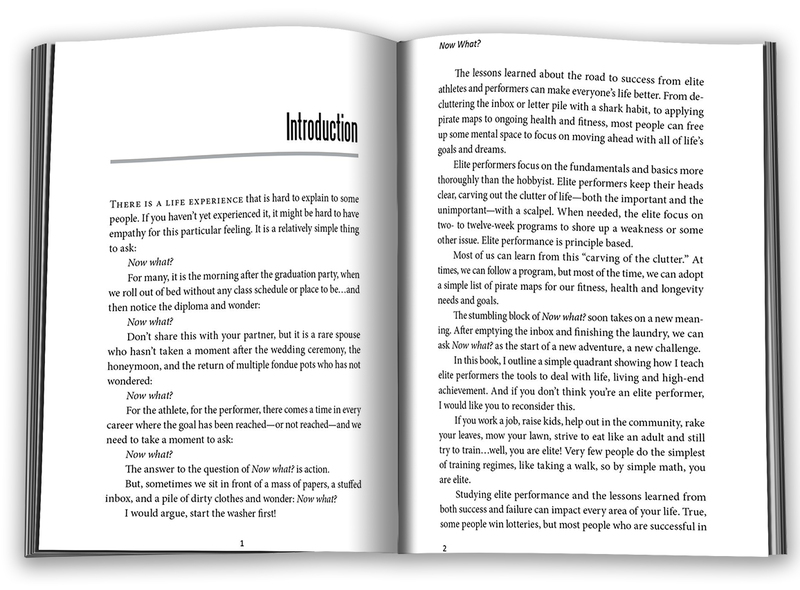 In this book, I outline a simple quadrant showing how I teach elite performers the tools to deal with life, living and high-end achievement. And if you don’t think you’re an elite performer, I would like you to reconsider this. What’s Covered in Now What? What assessments does Dan use? To learn all this and more, order your copy of Now What? today. 6×9 paperback, 313 pages, indexed. ISBN-13: 978-1-931046-68-8. The ebook and audiobook formats are delivered instantly via download from a digital dashboard here on OTPbooks.com as soon as your order is placed.